Round, white tablet. 5/16" diameter with "MNP 2" on scored side. INDICATIONS AS AT 31 APRIL 2004: In Patients with Hypertension. MINIPRESS (prazosin hydrochloride) is indicated in the treatment of hypertension of varied aetiology and all grades of severity. It can be used as the initial and sole agent or it may be employed in a treatment programme in conjunction with other antihypertensive agents. Renal blood flow and glomerular filtration rate are not impaired by long-term oral administration. MINIPRESS can be used with safety in hypertensive patients with impaired renal function. In Patients with Congestive Heart Failure. MINIPRESS is indicated in the treatment of severe refractory congestive heart failure. MINIPRESS may be added to the therapeutic regime in those patients who have become refractory to conventional therapy with cardiac glycosides and diuretics. In Patients with Raynaud's Phenomenon and Raynaud's Disease. MINIPRESS is indicated in the treatment of Raynaud's Phenomenon and Raynaud's disease. Benign Prostatic Hyperplasia. MINIPRESS is indicated as an adjunct in the symptomatic treatment of urinary obstruction caused by benign prostatic hyperplasia in patients awaiting prostatic surgery. 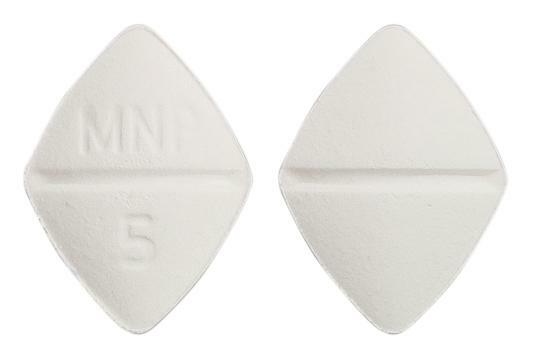 White, diamond-shaped tablet, scored both sides with "MNP 5" on one side. INDICATIONS AS AT 30 APRIL 2004: In Patients with Hypertension. MINIPRESS (prazosin hydrochloride) is indicated in the treatment of hypertension of varied aetiology and all grades of severity. It can be used as the initial and sole agent or it may be employed in a treatment programme in conjunction with other antihypertensive agents. Renal blood flow and glomerular filtration rate are not impaired by long-term oral administration. MINIPRESS can be used with safety in hypertensive patients with impaired renal function. In Patients with Congestive Heart Failure. MINIPRESS is indicated in the treatment of severe refractory congestive heart failure. MINIPRESS may be added to the therapeutic regime in those patients who have become refractory to conventional therapy with cardiac glycosides and diuretics. In Patients with Raynaud's Phenomenon and Raynaud's Disease. MINIPRESS is indicated in the treatment of Raynaud's Phenomenon and Raynaud's disease. Benign Prostatic Hyperplasia. MINIPRESS is indicated as an adjunct in the symptomatic treatment of urinary obstruction caused by benign prostatic hyperplasia in patients awaiting prostatic surgery. 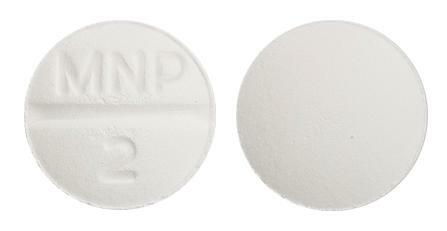 Capsule-shaped orange tablet with "MNP 1" on one side and scored on the other side.